It’s been a long silence I know, but things have been happening. We’re back from our visit to Toulouse, and… we have a new house. Even better, it’s FANTASTIC! Fifty percent bigger and much better than where we are now, and comes complete with a garden of 2500 square metres (yes we do have to mow it, we’ll cross that bridge when we get to it). 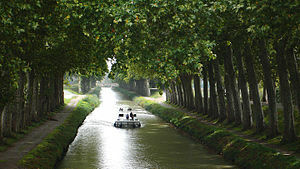 It faces the beautiful Canal du Midi and is surrounded by a wheat field. I can’t wait to move. As for business, it’s also booming. The funny thing is that while we were away doing full-on house-hunting, I had no work coming in. The day we arrived back here, it started pouring in. As if it had been organised.